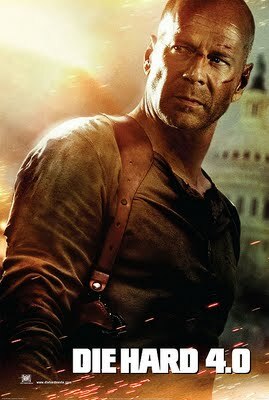 It’s been twelve years since we last saw John McClane. Now thanks to an interesting new application of the delete key by a group of bad guys who don’t seem to do things the simple way when there is a complicated way to do it, he’s back in action. This is the kind of popcorn logic film that Hot Fuzz sent up so well earlier this year. The original Die Hard has its moments of action silliness but this one went sillier several times. Thanks to great acting and the fact that even when its being silly it stays, somehow, inside its own logic it holds together and I easily forgave the silliness. As with the earlier films there is a strong techno thriller element to the story which again holds up despite a few floors in the underlying logic. CSI and other films and TV shows have created a world in which many things that take time can be done instantly and many bits of information that are not available on a computer or if they are will not accessible over the Internet are. This film lives in that universe. It has to for the plot to work. I’m sure there is a story out there that could build tension by having DNA tests take time and having someone have to go to a building to get the plans of something but I doubt I have the wit to write it and make it as good as Die Hard 4.0. I’d also like to congratulate them on having the good sense to avoid trying to shoe horn characters from earlier in the franchise in for no other reason than they were in the earlier films. The new characters were all worth watching. They kept their powder dry on McClaneisms and didn’t over use references to the earlier films. As a result when they did get used they had an impact. Overall an excellent addition to the earlier Die Hard films well worth a watch if you enjoyed them. Please let me know if you agree with me. Glad to hear you really liked this. I think we'll be seeing it this weekend and all I've heard is good things about it.